Charity Bingo featuring everyone’s favourite hillbilly Cletus! Live music from Mahoney & The Robertson Privilege! I have been to the Silver Buckle on two other occasions besides on St. Patty’s Day, and 2/3 of my experiences were terrible! My first experience was on a wing night. The place was steady but far from being overly busy. It was forever until we even received a “hello” from a waitress, yet she passed us numerous times. We finally got our drinks and wings, however we were missing a couple orders of wings. We let the waitress know, and she confirmed they’d be at our table soon. I asked for a water and she said I had to pay over $2 for a bottle of water, stating, that on wing nights, they do not give out free water! But yet, I had a couple drinks already and had bought numerous orders of wings! Needless to say after an hour we still had yet to receive our missing wings or any refills on our drinks. When trying to get our tab we had to hunt her down, to find out she transferred it to another server, and to find her! When we finally received our tab, it had drinks on it we never had and still had the wings on it we never received! I told the new server we did not recieve the wings or the drinks and she said she’d figure it out for us. The old waitress then came back with the receipt and asked what was wrong. We explained and she told us she’d get us two sets of wings for free. We denied, since we’ve been there over an hour and a half and were ready to leave. She then became very rude, told us she’d take off the wings we didn’t receive and stormed off. Before leaving I asked the bar if I could speak to a manager, they told me no one was in and to phone later. I did, and still no manager, so I left my name and number, and of course I did not get a call back. I returned on on St. Patty’s Day with a group, intending to have a sociable night. It took us 20 minutes just to receive our first drink, and when our drink arrived the order was all wrong, however that wasn’t a big deal. We were far from picky. After a good half hour, our drinks were empty and the waitress hadn’t been back. After 45 minutes and no sign of the waitress, me and my husband decided to hit the bar for our drinks, where we witnessed our server hanging off a customer and taking shots! At the beginning we didn’t think anything about the lack of service, because the place was busy and giving the waitress the benefit of the doubt, but to see her doing shots instead of serving the customers is very unprofessional. Throughout the night we witnessed her behind the bar taking shots and when she did finally come back to our table, she was incoherent and stumbling! It was then we decided to pay our tab and leave. I have wanted do this post for quite a while now but I didn’t have enough research, so I decided this might be as good as time as ever, seeing as it is St. Patrick’s Day and all. The post name is self-explanatory. 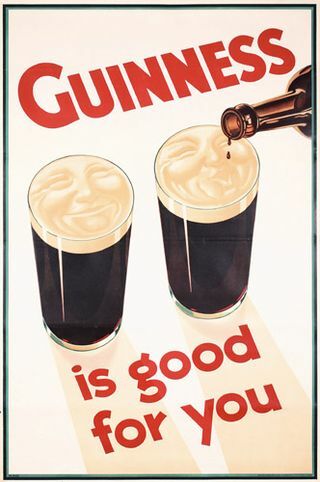 Where in the city can you grab a delicious pint of Guinness? Well, as it turns out, only two places to my knowledge. Now, what I mean when I say “pint of Guinness”, I ain’t talking about from a can or something, I’m talking about on tap! This is also what I meant by research, I have only found it at two pubs/bars, but with that being said, it’s probably at some others. So if there is any other places that you guys/gals know, please comment so I can add them! Not only does Original Joe’s have Guinness on tap, they also have a huge selection of other beers, house beers, and hybrid beers. View our review on Original Joe’s by Sean. This is one of my favourite pubs in the city. The laid back atmosphere, Dale’s Pizza attached to it, and Guinness – Combine those three things and you will have a full belly and a good night. Dale’s Pizza, located at 687 South Railway Street S.E., in the same building as the popular pub, The Silver Buckle lays a hidden gem among pizza lovers. I have experience the pizza menu that Dale’s Pizza can offer around three times so far (that I can remember). Each time I have sat in the pub to enjoy the pizza goodness with a couple Guinness’ (which is on tap by the way at The Silver Buckle). It may seem odd to review such an obscure pizza place, but, trust me, it’s because of the quality and taste that I am passionate about it. I’ve probably ate every kind of pizza available in this city, and for sure, Dale’s Pizza ranks above them all for me. With a mixture of fluffy homemade-style pizza crust and just the right amount of tangy pizza sauce and mozzarella, you are sure to get your stomach’s worth of good deep dish goodness. The price ranks a bit above places like Pizza 73 and Pizza Hut, depending on the toppings. But the taste surpasses both of the aforementioned places in my opinion. We usually order the large or medium size (depending on the amount people with us) with Pepperoni and Salami and top it up with the right amount of parmesan and chili sprinklings. If you haven’t tried Dale’s Pizza yet, it’s worth the test especially if you are already at The Silver Buckle. It’s not overly greasy and it’s not bland at all. Be careful though, you may gain some lethargy after eating it, especially after a couple beers, candy, and playing Nintendo 64 – that’s just my experience anyways. Today (October 5th) is Alexander Keith’s 214th Birthday, and hatters can celebrate tonight with the annual party at The Silver Buckle. 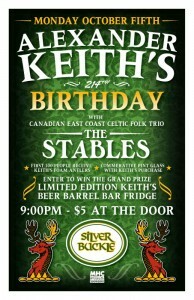 East coast celtic folk trio The Stables will be the entertainment of the evening (they actually have a bass made out of a hockey stick, a wash basin and a string, that’s reason alone to check it out). 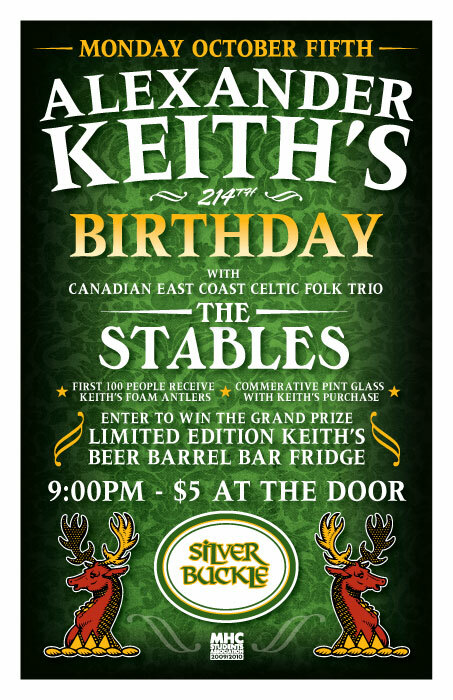 There will be giveaways all night, with the grand prize a limited edition beer barrel bar fridge, which has been on display at The Buckle for the last week or so, as well as the staple Keith’s foam antlers and commemorative pint glasses. 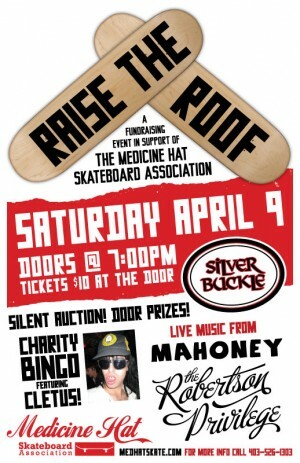 The party gets started at 9:00PM, $5 at the door. 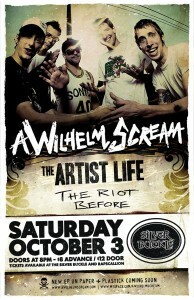 A Wilhelm Scream from New Bedford Massachusetts will visit Medicine Hat on Saturday October 3rd to rock The Silver Buckle with special guests The Artist Life & The Riot Before. Tickets are only $8 Advance / $12 Door, available at The Silver Buckle and Rapscallion, a steal of a deal for a great 3 band punk rock bill! 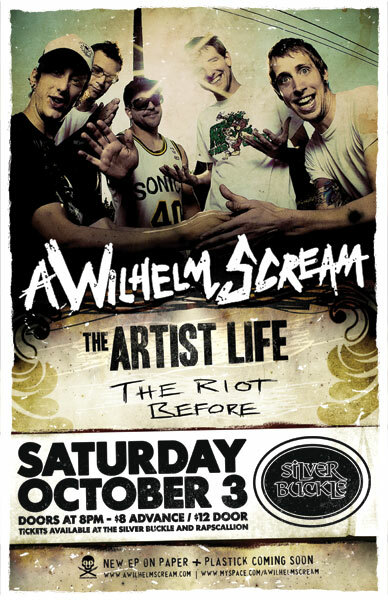 Wilhelm played The Doghouse (RIP) just over a year ago to a packed house and are by far one of the best fast technical punk rock bands around. Bass player Bri Robinson is a native of Canada, previously of the Toronto outfit The Fullblast, and had been named Bass Player of the Year by Alternative Press. Check out the video below to see why!